W London launched its Dining Series, where different chefs collaborate with the hotel on a new menu, back in November 2017, and after kicking off with Magnus Reid (of Hackney’s Legs), Ravinder Bhogal is the next chef taking the reins. And she’s done so with an entirely vegan menu, created in homage to her niece. 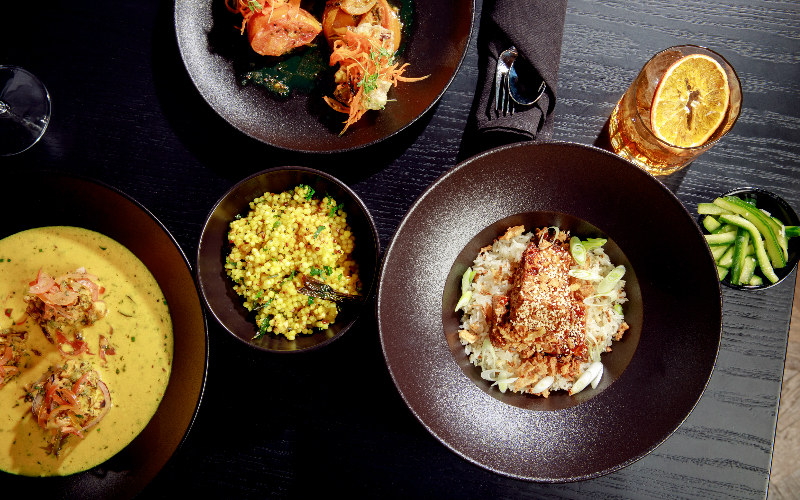 There’s a South East Asian and Indian influence on the menu, although some Middle Eastern flavours creep in too, which is very much in-keeping with Ravinder’s global style at her own restaurant Jikoni. We started with a big portion of cauliflower popcorn with a black vinegar and chilli dip, and moreish beetroot and walnut kibbeh, similar to falafel just with the walnuts adding a bit more texture. We also loved the caramel braised tofu with confit garlic rice… the tofu had a great crispy crust, the best way to have it in our opinion, and the chilli smacked cucumbers on the side added a nice sharp kick. Though we were intrigued by the “cheesecake”, for desserts we opted for the rose, coconut and cardamom doughnuts, which were less bready than we expected and more like a syrup-soaked fritters (though not sickly sweet), and the lighter, zestier charred pineapple with lemongrass and lime leaf sorbet. Ravinder’s food here is less about making vegan versions of dishes by swapping in alternatives (though there’s absolutely nothing wrong with that – everybody has the right to pizza, cake and fried “chicken”) and more about using ingredients in interesting ways. Even though we’re not vegan ourselves, we were won over and didn’t miss the meat, fish or dairy at all.